In 1965, Yerevan was filled with demonstrations commemorating the 50th anniversary of the Armenian Genocide. These demonstrations marked a turning point in the development of Armenian nationalist feelings, in terms of the politicisation of the Genocide question and the reaction of the Soviet authorities to them; they were not met with the same violence that had typified the Soviet hold on its peripheral republics. 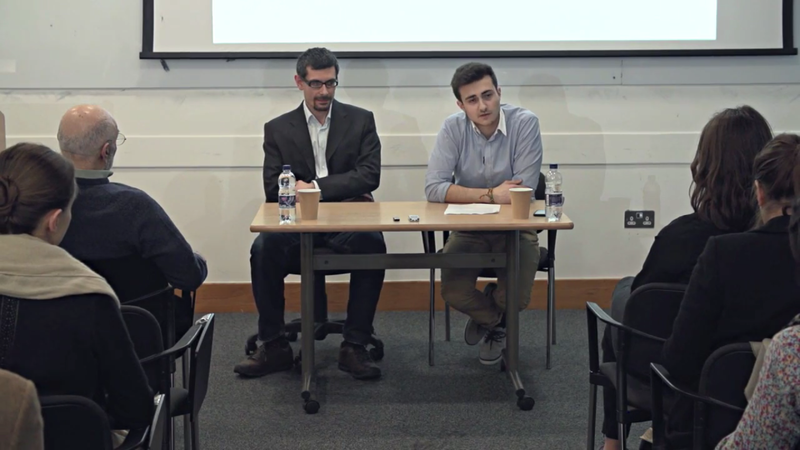 This dynamic relationship between displays of Armenian nationalism and the response of the Soviet authorities at the national and local level was the topic of the lecture given by Dr Arsène Saparov of the University of Sharjah, UEA, who earned his PhD at the LSE and authored the book From Conflict to Autonomy in the Caucasus in 2015. Chairing the lecture was Raphael Gregorian of the Programme of Armenian Studies. Dr Saparov began by outlining the importance of the 24th April 1965 protests in the Soviet context, specifically highlighting the fact that these protests were allowed to take place without being subject to state violence. This was in contrast to other similar manifestations of popular sentiment, such as the unauthorised demonstrations in the Russian town of Novocherkassk and in Tbilisi ten years earlier, where in both cases the Soviet authorities reacted with violence, leading to arrests and deaths. For Dr Saparov, the unusual case of Yerevan 1965 called into question the varying Soviet response to displays of nationalism in the Union’s peripheral republics. The topic was approached and interrogated with the following questions: what was the background of these demonstrations? Why did the authorities in Moscow not disperse the demonstrations? Why did the local authorities permit such public mobilisation? Why did demonstrators risk their careers and safety to join the demonstrations? How did these demonstrations affect the development of the Armenian nationalism? In the attempt to answer these questions and analyse the events in the wider context of the trajectory of Armenian nationalism within the USSR, Dr Saparov indicated the significant roles played by the Armenian public, the local authorities, and central authorities in Moscow. Dr Saparov investigated the events of 1965 and the opinions surrounding the demonstrations through the analysis of three open letters to the Soviet Union written by Armenian intellectuals; one from Moscow, one from Tbilisi, and one from Yerevan. As background to the events, Dr Saparov highlighted the fact that in Soviet Armenia, Armenians had not been allowed to discuss any land claims from Turkey, as Moscow (specifically Stalin) did not want to deteriorate relations with Ankara. At the same, however, thanks to Stalin’s migration programme to bring in Armenians from the Middle East to the Armenian SSR, a large proportion of the population were refugees from the Genocide. As a result, there were underlying tensions in the populace regarding territorial claims against Turkey; the migrating Armenians brought with them the idea of April 24th as a day of commemoration in the diaspora, a means to express the withheld emotions. After 1956, following the beginning of Khrushchev’s process of de-Stalinisation, people in Armenia began to speak more freely, and it was in this context that the letters were sent. The Armenian Communist Party’s letter to Moscow in 1964 displayed three themes typical of letters sent to the central authorities. Firstly, the letter portrayed absolute commitment to the Soviet Union and authorities in Moscow as the higher powers, also pointing to Armenian loyalty to the USSR’s predecessor, the Russian Empire. Secondly, it began to describe a destitute situation, lamenting the suffering of Armenians which came about as a result of its pro-Russian stance, such as the Genocide of 1915. Finally, the letter depicted outright threats to the Soviet Union, describing how the Armenian diaspora commemorated the anniversary of the Genocide, and so, to avoid tarnishing the image of the Soviet Union, they recommended the central authorities allow publications to remember the anniversary with a newly built commemorative obelisk. The authorities’ reply, giving permission for the commemorations, was received only three months prior to April, forcing preparations to be completed in a rush. Moreover, what commemorations were organised were different from what the Armenian public had expected, involving only a few secret lectures, and a lack of condemnation. Dr Saparov then presented the other letters, which displayed a spectrum of opinions; the letter sent to the central authorities from Georgia displayed strong and optimistic support of the Soviet Union, seeing the recognition of the Genocide as a means to improve the USSR. The other letter sent from Yerevan was deemed to be diametrically opposed, offering a sarcastic flair. The letter was returned to Armenia with a note to bring the author to ‘discuss’ matters further in Moscow – undoubtedly an invitation for incarceration. The authors of the three letters knew the Soviet view of nationalism, and so by sending such letters were putting themselves at risk. Together, the letters demonstrated the changing and varying opinions and consciousness of Armenians in Soviet Armenia regarding the intermarriage of national identity, national mourning, national demonstrations, and submission to Moscow. On the 24th April 1965, the demonstrations, which had no central organising committee, were held around Yerevan in Lenin Square and outside the Komitas Pantheon. Dr Saparov described how the Communist Party attempted to channel the demonstration away from Lenin Square, as such a demonstration of nationalist feeling was a very un-Soviet expression against the ruling ideology. Such a show of nationalist fervour in Lenin square, an area propagating the official Soviet ideology of brotherhood amongst the members of the Union, demonstrated an interesting dichotomy. In Opera Square, the public believing that the commemoration belonged to all and not just a select few, broke into a private commemoration service being held in the Opera itself, shouting nationalist slogans, which prompted the Soviets to respond. The Armenian public perceived the Soviet Union’s 1965 commemorations as sub-par (where the central authorities did not condemn what had happened), and this catalysed the sentiments of the Armenian population, galvanising them to demonstrate in more eagerness. As a result of the poor handling of the demonstrations, the head of the Armenian Communist Party was fired. In 1967, the Armenian authorities built the requested memorial obelisk, and it became a rallying point for demonstrations that would take place every year from then on. The location was purposely chosen to be far away from any Soviet icons, such as Lenin Square, to avoid a repeat of the display of nationalism in distinctly Soviet areas in 1965. By 1967, the local authorities had developed an entirely different script to commemorate the anniversary; to show that they were successfully managing the Armenian population and their sentiments, the local authorities had to ensure that they would not lose their grip on power to some grass roots movements. For their part, the Soviet authorities, in order to deflect the angst of the Armenian population, decided to allow the commemorations to go ahead, ensuring that their demands and discontent was aimed at Turkey rather than Moscow. Rather than being seen as a directly instigated move on behalf of the USSR, Dr Saparov argued that the demonstrations and the subsequent commemorations in Yerevan were the result of a dynamic relation of reactions. In the short run, Dr Saparov argued that Moscow came out successful, by keeping the Armenian population happy and directing their negative emotions towards Ankara. But in the long-term perspective, such action allowed the Armenian population to mobilise around the recognition of the Genocide and territorial land claims. Thus, Dr Saparov concluded, the permitted demonstrations had stronger repercussions than Moscow would have wanted. After the main presentation, the floor was opened to questions to interrogate the situation and Soviet response in different perspectives. One question asked whether Dr Saparov believed that the Soviet Union had a grand strategy to deal with the peripheral nationalities, to which Dr Saparov replied that the general approach was very much constructivist blaming of disturbances on the by-products of capitalism. After the reign of Stalin, though, the Soviet Union turned to a more primordial approach to national identity, but still emphasised that there was no coherent plan in the longer term. Another question was about the role of the Catholicos Vazken in the demonstrations, and Dr Saparov replied that, knowing the danger that Soviet troops would present, the Catholicos most probably took a stance of calming the crowds rather than arousing their passions. He also detailed how the demonstrations marked the convergence and fusing of the ideas of territorial demands and commemoration of the Genocide. Dr Saparov stated that immediately after the demonstrations, several letters signed by thousands were delivered to Moscow, demanding the return of Karabakh to Armenia, a fact which demonstrated how the question of territory had become infused with the Genocide issue. Finally, Dr Saparov mentioned how, in token symbolic acts, the Soviet authorities attempted to rehabilitate Andranik, who, although was seen on the one hand as a warlord who fought against the Turkic populations of the Caucasus, was also the only person from the civil war era who could be rehabilitated because had not fought the Russians. The 100th anniversary of his birth was in February 1965, and was accompanied by the printing of articles commemorating him. Being a few months prior to the Genocide commemorations, this rehabilitation sent a clear message to population that they could now speak about things that they could not have spoken about before.